The lightweight Sachtler flowtech 100 MS Carbon Fiber Tripod with Mid-Level Spreader offers notable stability and quick setup and adjustments for payloads up to 66 lb. 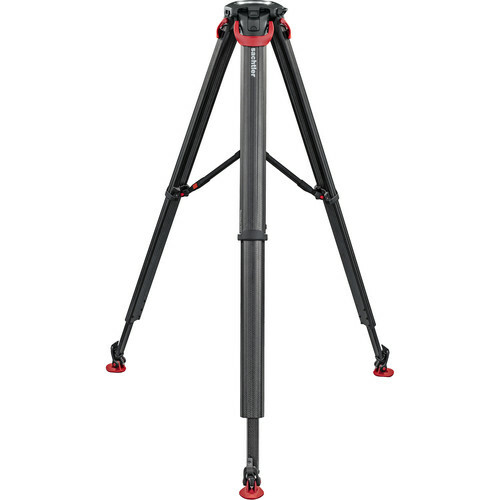 The novel flowtech design features quick release locks at the top of the legs, eliminating the need to stoop while adjusting the tripod height. All three legs can be deployed simultaneously to quickly find their individual levels on uneven ground. Box Dimensions (LxWxH) 28.5 x 7.4 x 7.1"
Am I able to attach Flowtech tripods to &ldquo;tripod caster dollies&rdquo;?